In Fabricating Histories, Northumbria University, in collaboration with Tyne & Wear Archives & Museums, are exhibiting a collection of objects from the nineteenth century and exploring ideas around historical fashion, technology, science, literature, and art. Why is the nineteenth century so interesting to us from today’s perspective? Our guest blogger, Lee Joseph Peacock, is studying BA (Hons) Fashion Communication at Northumbria University. His upcoming dissertation project involves the weird and wonderful world of Victorian England and the mourning customs of the time. 5 things you may not have known about mourning in Victorian times. In a time where death was acknowledged more often than life, Victorians developed many different traditions surrounding their mourning practices. With a combination of art, superstition, fashion, and technology, we are taking a look at five of the different areas linked with death formalities of the time. 1 – The dress and duration of mourning. 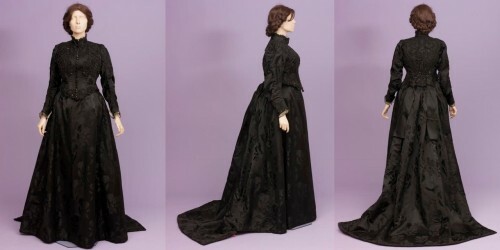 Mourning clothes were taken extremely seriously within Victorian times. For the lower classes, their mourning attire would have most likely been some of their most expensive clothing. Men had it simple ­- dark suits accompanied with black gloves, hatbands and cravats – whereas the women had the more uncomfortable ordeal of wearing heavy, thick fabrics to emulate the emotions of the day (and beyond). This would be paired with jet-black jewellery often combined with hair of the deceased. The duration of wearing these clothes depended on how well the wearer knew the recently departed. A new widow would be expected to mourn her husband (and wear the full attire) for two years, unless the woman was deemed old and in that case she was expected to mourn until her own passing. Everybody else was presumed to be easier to lose! Mourning a parent would be expected to take one year, whereas grandparents and siblings would be mourned for six months. With such low age expectancies and large families, Victorians were in mourning more than they weren’t throughout their lives. 2 – Mourning dressmakers would have been some of the wealthiest members of society. Due to mass religious practice, large families and a high death rate from undiagnosed or underlining diseases, there was always work in dressing the recently bereaved. Holding onto your mourning wear was believed to be bad luck and would bring untimely death onto the family, so most would discard their outfits after wearing them. This meant that once another family member inevitably died abruptly, more clothing would need to be made and paid for. This often gave the dressmakers – ironically – customers for life. 3 – Hair of the dead. Hair of the deceased was used in many different ornamental ways. 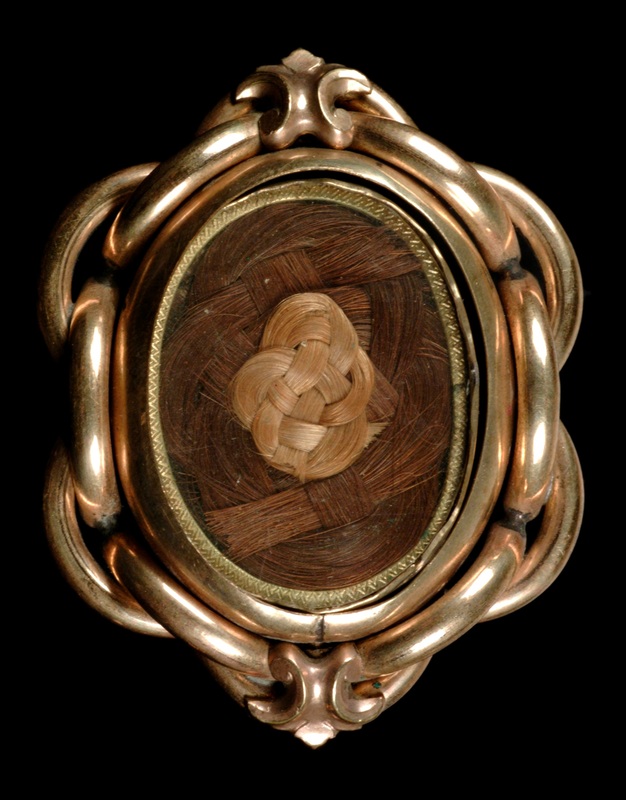 It was worn in jewellery such as brooches, hair accessories and pendants, but it was also used to make wreaths. These would be displayed in the home proudly for all to see. The idea of the hair wreaths had many symbolic meanings: it showcased the connections of those who had passed with the living, entwining the hair of both the deceased and living together in a decorative form. Swivel two-faced medallion, one side with plaited hair, blonde and brunette, the side empty, displaying a black background bordered with gold band, medallion set in pinchbeck frame of intertwined design. 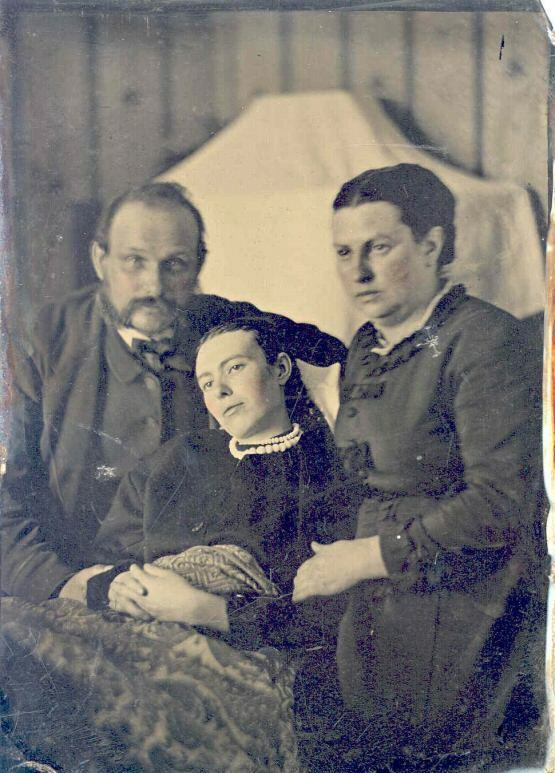 4 – Photographs of the deceased. Another popular way to commemorate the dead was having one last family portrait taken, posing the deceased with their remaining, living family members shortly after they had passed. Due to the nature of photography and technology surrounding it at the time, the deceased were always sharper in photograph than the living. This was due to photographers needing to use long exposure times when taking photographs. Long exposure time meant capturing every slight, natural movement of the living, whereas the deceased and their obvious lack of movement kept them still and in focus. Although sounding extremely disturbing in comparison to the modern day, the photographs often had the dead posed in ways that gave them the illusion of sleeping or at rest. This was especially popular with stillborn children. Not strictly about the mourning practice itself, the safety coffin is one of the most iconic totems surrounding the topic of death in the nineteenth century. Due to limitations in medical science and technology, many people were pronounced dead (and in some cases rumoured to be put into the ground) prematurely. There were outbreaks of many diseases at the time that would leave the body in a comatose or trance-like state. This would then take nothing more than a careless physician or an underlying disease to pronounce the sufferer as deceased, and for the funeral preparations to begin almost instantly. Due to rumours of this spreading fast and far, large amounts of the population understandably developed Taphophobia (a fear of being buried alive). An answer to this dilemma was the safety coffin. One style of safety coffin had a bell waiting upon the grave with a chain or sturdy rope leading down to the body; the idea was that if a body awoke they would pull the chain and sound the bell for help. In theory a perfectly good idea, but in reality, unless a gravedigger was being paid to watch over the graves, there would be nobody around to hear the ringing of the bell.